Anatomy: Capybaras are the largest rodents on earth. They can weigh more than 100 lbs (45 kg) and grow to be 4 feet (1.2 m) long and 2 feet (0.6 m) tall -- much larger than their guinea pig relatives! They have a heavy, barrel-shaped body which sits on relatively squat legs, shorter in the front than the back. Their brown fur is coarse and sparse enough to reveal the grey skin beneath it. Capybaras have partially webbed feet, which help to propel them through the water or swampy areas. Similar to a hippopotamus, the capybara’s eyes, nose, and ears are located on the top of its head, allowing it to peek above the surface for a breath of air and a quick check for predators while the bulk of its body remains hidden beneath the water. Habitat: Capybaras are found in Panama, Colombia, Venezuela, Guyana, Peru, Brazil, Paraguay, Northeast Argentina and Uruguay. They are semi-aquatic and will spend most of their time in dense vegetation around rivers, lakes, ponds, marshes and swamps. Feeding mostly in the afternoon, and on and off at night, capybaras tend to doze in the morning. They take short naps throughout the day while other members of their group stand guard. Diet: They are herbivores and eat the vegetation that lines water sources and other aquatic plants. An adult capybara can eat 6 to 8 lbs (2.7 to 3.6 kg) of fresh grass a day. They also eat their own poop, which contains beneficial bacteria that helps their stomach to break down the fiber from the grass. 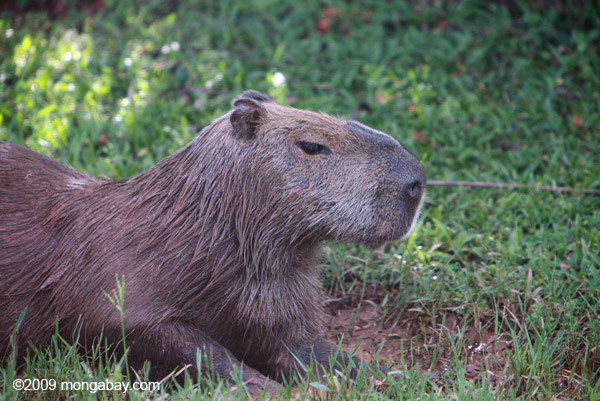 During the dry season or in drought conditions, capybaras will also eat grains, melons, reeds and squashes. Threats: Capybaras are naturally threatened by jaguars, caimans and anacondas, and their young can be taken by ocelots and harpy eagles. Their main threat, however, is humans -- they are hunted extensively for their meat and their hide, which can be made into leather. In some countries, the practice of farming capybaras has sprung up, relieving some of the pressure on wild populations. As with all rainforest inhabitants, deforestation also poses a threat. Capybaras eat grasses, fruits and water plants. Capybaras live near lakes, rivers and streams. months and the litter consists of about 2 - 8 offspring. Capybara are semi-aquatic so you can find them on riverbanks, in marshes, reedbeds and in estuaries. They also live happily on cattle ranches. However, you'll never find a capybara far from water. Capybara are really sociable. They live in huge family groups, usually of 10-20 animals, but sometimes up to 100 can be found together! As you might expect from sociable animals, capybara like to make a lot of noise... they tend to chatter to each other when in groups, and also make a barking sound like a dog when they are scared, or when they are rounding up their babies. They also communicate through smell, using special scent glands on their bottoms and on the males' noses (which you might be able to see in this picture). They use these scent glands to mark their territories, and each capybara probably has its own individual smell that they can use to recognize each other. Capybara are herbivores, meaning they eat the leaves of grasses and other plants, although they sometimes eat fruits too if they can find them. They are fussy eaters though, and are known to only eat certain plants and ignore ones they don't like. They can be active during the day or the night, depending on how safe they feel. 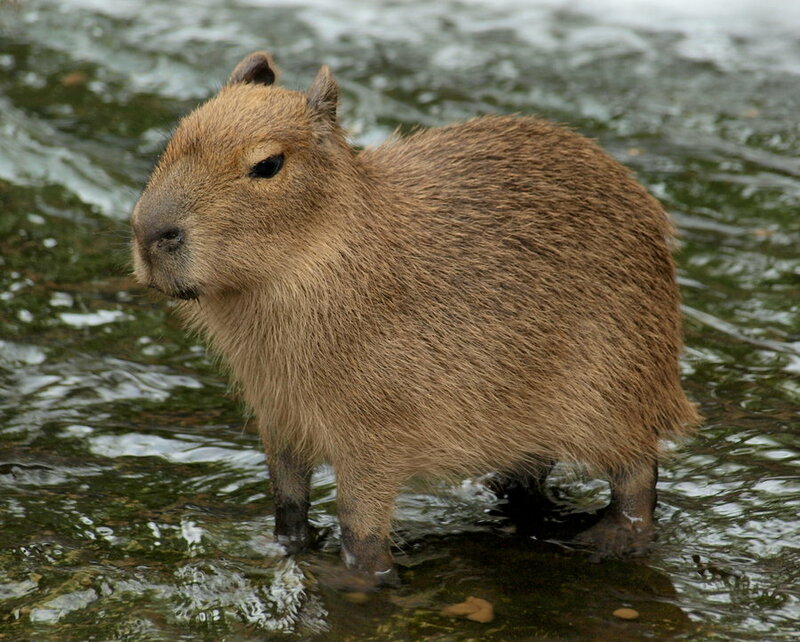 In areas where capybara are hunted by people, they tend to be active at night to avoid being spotted. Capybara are listed as of "Least Concern" on the IUCN Red List, which is a record of animals and birds that might be endangered. This is because they live across a wide range, there are lots of them, and they don't seem to be declining fast which is good news. However, we must be careful that this doesn't change, and that they don't become endangered. The capybara is the biggest rodent in the world! So, the capybara is related to mice, rats and hamsters… but it grows up to 4.5 feet long and 25 inches high! Its closest relations are other big rodents like agouti, chinchilla and guinea pigs. Capybara make a tasty treat for predators, like the jaguar, puma, ocelot and even the huge anaconda. This means that although they can live for 8-10 years, lots of them only make to four or five years old before they are eaten... They are specially adapted to living in the water, having webbed feet to help them to swim, and dense fur. They can stay underwater and hold their breath for up to five minutes, which is useful when trying to escape from predators! They have their nostrils high up on their noses, so they can stay in the water and still breathe easily, which means that on very hot days they can keep cool by staying in the water.